In buying the luxury glove-maker, Georges Morand, the group is embarking on a new stage in its development, harnessing the French expertise of glove-making and developing the production of ever more technical gloves. LIM Group dominates the world market in high-end, custom-made riding saddles, with its CWD and Devoucoux brands. As the guarantor of excellence in French saddlery, LIM Group has become an outstanding player in the competitive sports industry, as vouched for by the world’s best riders. No-one can rival its comprehensive mastery of the value chain, from the animal hide right through to placing the saddle on the horse’s back. In buying the luxury glove-maker, Georges Morand, the group is embarking on a new stage in its development, harnessing the French expertise of glove-making and developing the production of ever more technical gloves. “The leather industry is the beating heart of LIM Group. Our design/production/ distribution model enables us to integrate traditional know-how to meet the needs of our customers, who are looking for products enabling them to perform at the highest levels” says Laurent Duray, CEO of LIM Group. “At Saint-Junien, the very cradle of the glove-making industry, this tradition dates back to the 11th century. Georges Morand masters all types of leather (lamb, kid, goat, cow, python) and all types of glove stitching. The techniques involved in producing a glove are very different to those of saddle making and other leather goods. But our brand is not a sleeping beauty. Technology is at the core of our workshops and military precision is as much our inspiration as haute couture. By coming together, we will protect this unique French expertise and ensure it can really develop in terms of innovation, performance and exportation,” explains Frédéric Morand, CEO of Georges Morand. 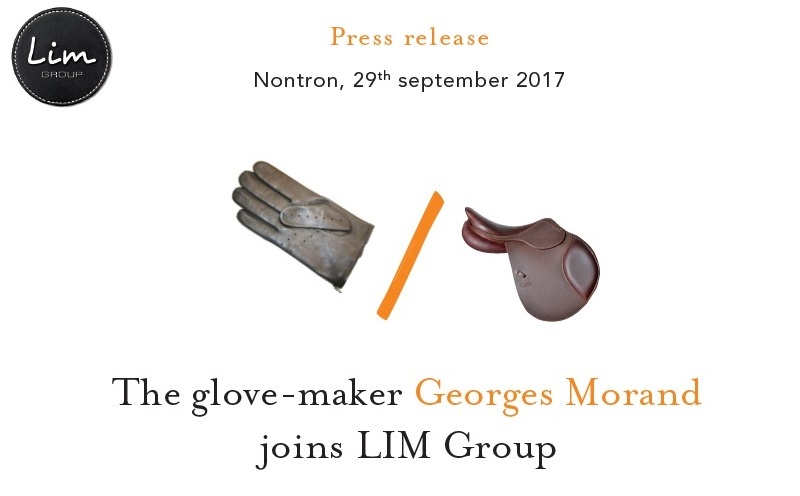 By joining LIM Group, the glove-maker Georges Morand will benefit from its own developmental environment, enabling it to tackle globalisation head-on and turn it into an opportunity, thanks to the Group’s five distribution subsidiaries in New York, Los Angeles, London, Sarrebruck and Hong Kong. “Leather, innovation and excellence to the extreme – it is, quite simply, our products’ reputation which unites us. Our technical and human resources are adapted to both small-scale and large-scale production. Both companies are proud holders of the Entreprise du Patrimoine Vivant (EPV) label, a distinction granted by the Minister for Industry and SMEs. The foundations of the Georges Morand brand will help us launch new activities and develop into new markets, heralding what can only be a successful future,” concludes Laurent Duray. LIM Group already has lofty ambitions for its new foal. Achieving €5m turnover by 2021: consolidating its presence in public military contracts, strengthening the position of the glove-maker in the luxury sector, launching a sales site for on-line sales of the most technical styles of gloves. To do so, the Group will hire and train young people in the glove-making trade, as it already does for saddlery. It will address all its fashion and sporting customers more directly and will use its riding clientele to grow brand recognition for gloves and other high-end products. – €47.2m turnover, of which 61% is exports.